We all know that "organic" has become a trendy label, and all sorts of questionable practices are being used by big manufacturers who technically qualify as organic, while ignoring the real spirit of organic farming. Two links on the topic: click here for a very useful rating of organic dairies based on criteria such as control over milk production and percentage of profits that go to family farmers; and click here for the standards of "authentic food," food which reflects the values that organic once implied. I'm home sick today, wishing I had some good homemade chicken soup in the freezer. I don't. I should used up some of the bags of salad greens in the fridge for dinner, but I wanted easy comfort, so Annie's Mac N Cheese it was. I pretty much keep a box in the house for sore-throat-stuffed-head-swollen-glands kind of days. For lack of anything more interesting to tell you about, I've posted a picture of Saturday night's supper. 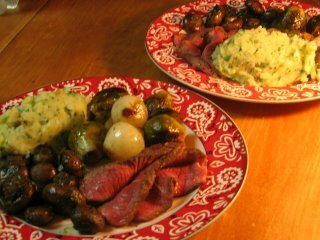 A pretty straightforward meal, but very satisfying - London broil, balsamic-braised Brussel sprouts and boiler onions, sauteed mushrooms, and buttermilk mashed potatoes with parsley. Prepping the vegetables was the most time-consuming part of the meal; once the onions were peeled and the sprouts trimmed, it was done in less than half an hour. I just wanted to share an experiment I tried this weekend that worked out beautifully. I was having an itch for bread pudding (something that happens once every, oh, month or so), and I also had about half a loaaf of stale bread to use up. So far, so good, except the bread was a rather dense part-wheat sourdough. Generally, I like to use brioche, cinnamon bread, plain white - anything soft and a little sweet. I wasn't too worried about the texture, because though the crumb may have been a bit tight, this loaf wasn't terribly chewy. I figured once it dried out, it would work fine. But sourdough? In a moment of inspiration (okay, not really a big one or anything, we're not talking Newton here), I decided to go with the sour flavor rather than fight it. So I used my regular bread pudding ratio, but subbed buttermilk for plain milk. Whisk together the buttermilk, cream and eggs. Strain through a sieve. Fold in the cubes of bread and let the mixture sit in the fridge for at least an hour. Fold in the raisins. Put the whole mixture in a buttered dish, then dot some butter on the top. Bake in a waterbath at 300 degrees. I skipped the vanilla I usually use, because I didn't want that sweet floral note to get in the way of the buttermilk flavor. The result: a lovely, old-fashioned bread pudding, with a nice tang which contrasted well with the dark sweetness of the raisins. Recommended, particularly if you, like me, often end up with ends of sourdough around the house. It's been a tough week here at Seasonal Cook. A very good friend is very, very sick, and I've spent the last week just waiting on news. I just called the hospital, and her condition has improved somewhat, so I'm feeling a bit more hopeful about things. Not surprisingly, I haven't really been thinking about food or blogging, but I did cook this weekend. I made bread pudding, ragu, clam chowder. All comfort food - and not just for the eater. Anyone who cooks, who is at heart a cook, no matter the skill level, takes comfort from preparing food. Certain foods are better for this than others. You don't want something too fussy - no spun caramel or architectural creations - but you don't want anything too easy either, like a steak that's seared and done in minutes. You need something to, for lack of a better word, nurture, to lay care on. A cook needs a ragu that simmers on lowest for a few hours, fed with a tablespoon of milk every once in a while. A cook needs a soup that has to be occasionally stirred and tasted, salt added, the heat adjusted. A cook needs to cut the bread for pudding, let it dry on low in the oven, let it sit in the fridge and slowly absorb the custard, and then bake the whole thing gently, gently in a bath of water. Sometimes we feed the ones we love. Sometimes we can't, and the food is only a substitute for the person we would like to be able to offer that tenderness and care. But, if we are cooks, we will always be found, whether in joy or in worry or in love, in the kitchen. Are you a posh green gourmand (guilty! ), a crunchy mummy, or a GenX econ-preneur? And remember, little man - don't you go to Goa. I was talking with some friends the other night, one of whom was reading in Calvin Trillin's Feeding a Yen and loving it, of course. (Although personally, I like American Fried best, with Alice, Let's Eat in second, because I always love the appearances of Alice.) This lead to a discussion of ouy own personal yens, the foods we don't have access to and miss actively, regularly. Eli Zabar's country sourdough - the really big loaf. The pizza with the very thing crust from that joint around the corner from my old apartment in Queens - I think the place was called Sol's? The cheese was different, possibly a blend of fresh and aged mozz. The sauce was spicy. Sol's (if it was called Sol's) represented my Platonic ideal of pizza. The cheddar/dill scones from the little shop in Bath where Sally Lunn cake originated. The chocolate rum balls from a bakery in Penzance. I have no idea how they made these so soft and melting and tender, but they did. The montelimar we made at CIA - dried cherries, not candied. Sigh. The home fries from the breakfast place near the river in Cold Spring, NY. They cooked a lot of red peppers in with the potatoes, and they achieved the perfect level of greasiness - just enough, not too much. The danish Alfred made at his bakery out in Forest Hills, NY. A little hole-in-the-wall, but the danish dough was all-butter and made by hand. There isn't much in the world better than a homemade danish. Unless it's a homemade English muffin, toasted, with cream cheese. That's another CIA memory. I could probably make those, though. I'm sure I have the recipe somewhere. But what I really want is for someone else to make them for me, and serve them up hot to go with my morning coffee. Big, fat blackberries hot from the sun. You don't get those in the city. 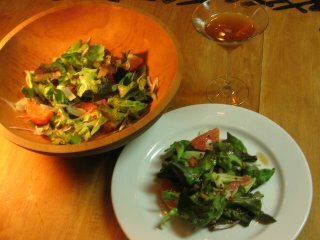 Just a simple salad my guy made on Saturday (from Chris Schlesinger, of course). Red leaf lettuce, orange segments, fennel bulb, red onion and a dressing made of red wine vinegar, olive oil, coriander and chopped green olives. (And lemon juice? Possibly.) This is the sort of combination it's nice to keep in mind for throwing together something that's easy, but tastes very sophisticated. 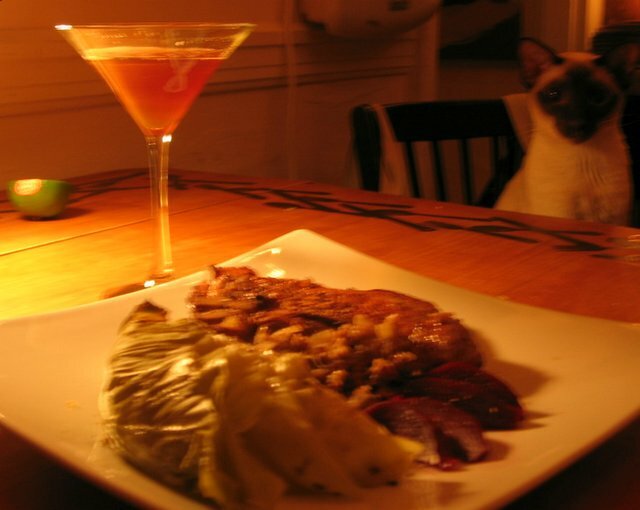 No need for a recipe, and with a nice T-bone and some baked potatoes, you'll feel like you're eating at a nice restaurant, only with cats, leftovers, and your own choice of background music. And cheaper drinks. Look at the size of those thighs! Turkey thighs, that is. I've never bought just the thighs from a turkey before, but they've always been my favorite part of the bird. 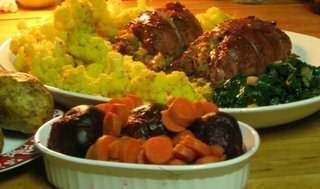 The whole stuffing business didn't really work out so well; these were not pretty, neat, little packages with stuffing evenly distributed throughout. More like lopsided lumps with the stuffing all hanging out on one end and falling onto the roasting pan. But tasty! For the stuffing, I caramelized some onions, then mixed them with rice and orange zest. The caramelized onion flavor didn't come through very clearly, but I think it did give a background of depth and sweetness. The orange zest was very flavorful (I used one of those cara-cara pink navels that have been in the stores lately). For a glaze, I blended some fig spread (which all the cool bloggers have been using lately, and which I love with all my heart), a bit of orange juice, some balsamic vinegar, and black pepper. I could have eaten that mixture straight from the bowl, so it was a bit disappointing that there wasn't enough glaze to really sauce up the thighs. I will definitely be making that sauce again, but next time I'll make enough to drizzle some on the meat on the plate. Overall, it needs a little tweaking, but I liked this dish. I might use wild rice in the stuffing next time, for a little savory contrast to the sweet flavors of orange and fig. Turkey thighs are cheap and actually taste like something, unlike turkey breast. Don't know why I haven't made them before. As you can see, I made a pile of vegetables as side dishes, mostly so that I would have lots of leftover vegetables for this week's lunches. That cauliflower wasn't flavored with turmeric or saffron - it's a yellow cauliflower called "Carnival." It has a nice flavor and a beautiful color, recommended. If you have a moment, write a note to the mayor of LA to let him know that you think an urban organic garden area that provides food for 350 poor families, improves a blighted neighborhood, and acts as a community center is a valid use of public land. Let him know that you don't think the city should sell this land to a developer for the creation of a Walmart's warehouse. Click here for info, here to send a letter. Okay, I'm not going to win any food photography awards for this one. But the meal was good. What I should done was take a photo of the main dish while it was still sitting in its cast iron skillet - two big, beautifully browned pork chops, nestled in a bed of kasha flavored with bacon, wild mushrooms and onions. I served it up with wedges of cabbage cooked in some chicken broth with caraway seeds, some slices of boiled beets, and a spoonful of Cabot sour cream. Very simple to pull together (cook the bacon, then brown the chops in the fat, remove, cook onion in fat, add kasha, some rehydrated dried mushrooms, cook a couple minutes, throw in the bacon, the mushroom cooking liquid, a little chicken stock, put the chops on top and toss in the oven) and very tasty. Of course, the sour cream and bacon don't exactly make this the lightest dish on earth, but we've discredited low-fat diets now, right? Bacon for everyone! Walter Willett, eat your heart out. So to speak. On a topic not culinary, but at least food-chain related, I watched a hawk scoop up a pidgeon today right in the heart of Porter Square. He sat on the top of a telephone pole with the pidgeon in his grasp, eyeing the commuters warily as if he expected one of them to try to climb the pole and take his prize away. I find it incredibly heartening to see hawks in the city. It's cold out today - not quite the unbearable bitter cold that hurts your face and teeth, but cold enough to make the wait for the bus seem very, very long. I'm daydreaming about my summer vacation. I've rented a cottage in Maine with a group of friends. You can see it here, if you're curious. The cottage is owned by an organic farm that sells goat milk, yogurt, cheese and maple syrup. I'm looking forward to sampling their wares and visting with the goats. Since booking this place, I've noticed that quite a few farms use rental cottages as an extra source of income. So, if you're planning a vacation this year, consider supporting a small farm. And if you've never been to the Northern coast of Maine, I highly recommend it. If you drive past Acadia, the tourists disappear, leaving behind lobster boats, rocky shoreline, blueberry barrens, pine trees, a few artists, some organic farms, puffins, a surprisingly good fruit winery, and the freshest air you'll ever breathe. And did I mention the lobster? Because, my god, the lobster. And the scallops. And the crab. It's shellfish heaven. And in August the blueberries are ripe - the tiny, spicy, wild ones, not the flavorless, oversized supermarket ones.